The XQ-58 Valkyrie in flight. 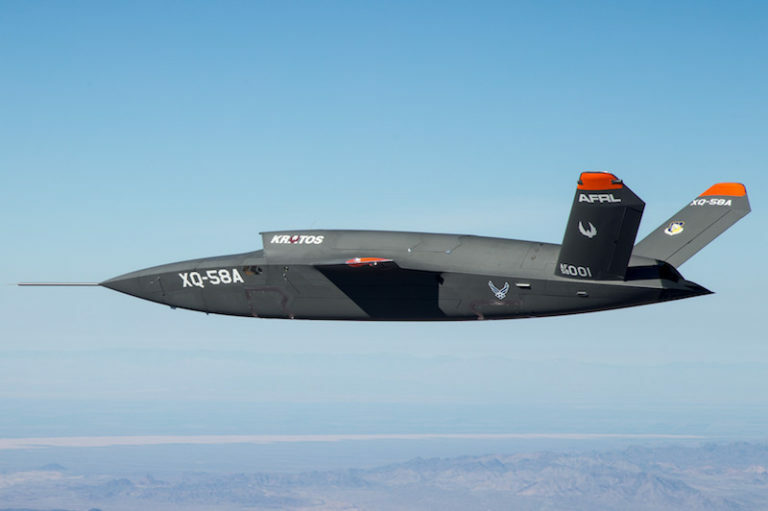 The XQ-58A Valkyrie demonstrator, a long-range, high subsonic unmanned air vehicle (UAV) completed its inaugural flight on 5 March at the Yuma Proving Grounds, Arizona. The US Air Force Research Laboratory partnered with Kratos Unmanned Aerial Systems to develop the XQ-58A. This joint effort falls within the Air Force Research Laboratory’s Low-Cost Attritable Aircraft Technology (LCAAT) portfolio, which has the objective to break the escalating cost trajectory of tactically relevant aircraft, the US Air Force said. The XQ-58A Valkyrie developed by Kratos, a market leader in target drones, launches like a rocket and lands with a parachute. Jeff Herro, Kratos’s senior vice president for business development, said he could see scenarios where both the Valkyrie and Boeing’s new rival unmanned system aircraft could accompany an advanced fighter jet like a Lockheed Martin F-35 given their different costs and capabilities. Defense contractors are investing more in autonomous technology as militaries around the world look for cheaper and safer ways to maximize their resources. Kratos has spent more than $30 million on the Valkyrie, designed to be “attritable,” meaning it could be considered expandable in some situations. The U.S. Air Force has also invested in the demonstrator, Herro said, estimating a formal purchase tender could be issued in the next two years. AAD 2016 to feature USAF aircraft never seen before in SA?